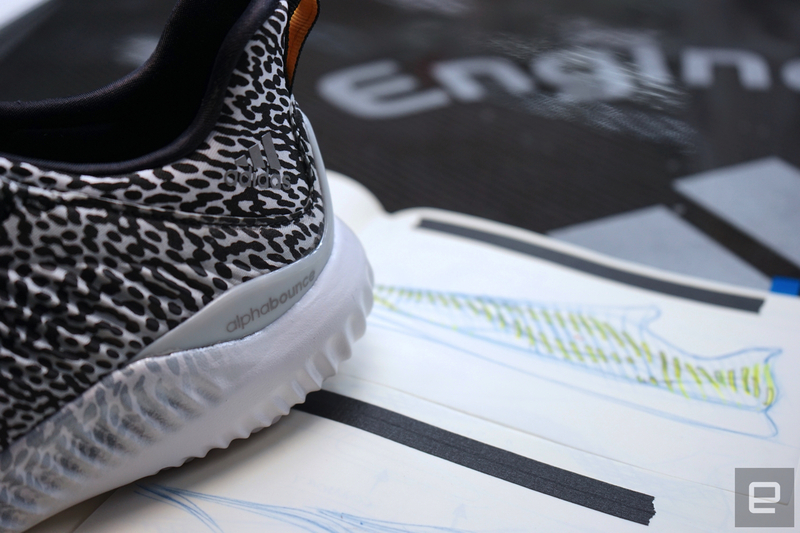 AlphaBounce is the company's newest performance-focused design. When Kanye West isn't wearing his Yeezys (or Vans, as he describes in a song on The Life of Pablo), he's often spotted in Adidas Ultra Boosts. Since being introduced last year, the Ultra Boost has quickly transcended its intended purpose as a running shoe, becoming an essential silhouette for sneakerheads everywhere. But despite Ultra Boost finding success in the streetwear community, Adidas continues to create products around a mantra from founder Adi Dassler: "It all starts with the athlete." That idea, combined with the use of evolving technologies such as motion capture, is what drove the design behind AlphaBounce, the company's latest running shoe. Before becoming a reality, AlphaBounce had to be shaped by ARAMIS, a motion-capture system that helps determine the amount of strain and tension caused by different materials. ARAMIS, which NASA has used to inspect the outer hull of space shuttles, combines high-speed cameras with flexion sensors to gather information at up to 500 frames per second. Since the software maps skin, bone and muscle, it can give Adidas engineers insight into how they should go about designing a more comfortable running sneaker. ARAMIS can visualize the level of comfort on every area of an individual's foot, from the heel to the toes, as well as indicate when the fabric may be getting in the way of performance. Adidas uses the ARAMIS motion-capture system to assess the tension of different fabrics. "It's a really versatile tool," said George Robusti, senior design director of global running at Adidas, of the ARAMIS system. "The technology enabled us to fine-tune how we approach the functionality of the product. You shouldn't need to think about the shoe being there." In the case of AlphaBounce, Adidas built the sneaker's upper with a flexible, lightweight material called ForgedMesh. It's supposed to fit like a glove -- but still be less weird looking than those five-finger shoes. While Adidas has relied on ARAMIS to build a product in the past (it used it with Ultra Boost too), Robusti said this is the first time a design was brought to life based on data collected from the motion-capture system. Those learnings, of course, derived from Adidas bringing in athletes to put AlphaBounce through its paces. As we sat and talked inside Adidas' headquarters in Portland, Ore., I asked Robusti how AlphaBounce compares to the Ultra Boost and NMD, two of the company's most popular runner lines. Unlike those highly coveted (and arguably fashion-centric) shoes, the AlphaBounce was designed primarily for performance, said Robusti, though it still needed a modern look. Adidas achieved that last part by mixing black, purple and orange colors, with a limited-edition speckled pattern meant to evoke the shoe used in Adidas' motion-capture tests. The AlphaBounce will be available in a limited-edition pattern meant to evoke the motion-capture testing that Adidas used to design the product. What completes the vision for AlphaBounce, and inspired its name, is the Bounce midsole, which has been redesigned to offer improved comfort and stability. Bounce, which debuted in 2015 with the Energy Bounce and Mana Bounce, is a type of elastic foam that's been engineered to feel soft and, well, bouncy (get it?). Ideally, Adidas says, the running experience should feel almost elastic. During a demo of the sneaker, the team behind AlphaBounce compared its blend of materials and design techniques to Apple's signature approach: seamless integration between hardware and software. "In the past, we've always used off-the-shelf materials or processes that have existed," said Andy Barr, Adidas' category director of global running. It was important that the company develop all of the AlphaBounce's components in-house, similar to how Apple owns or designs many of the components used in its own products. In particular, Barr pointed to the new upper materials used for ForgedMesh and the overhauled Bounce midsole. "We're always trying to create the new thing in the market," he added. "It maybe doesn't feel familiar straight away, but we know in a year, year and a half, it's going to push the whole market forward." Ultimately, Adidas intends to bring AlphaBounce's core technology to other products, including sports bras, apparel and different versions of the shoe. That said, it might be hard for AlphaBounce to reach the same level of popularity as the Ultra Boost and NDM or even Nike's Free RN. But at $100 starting today, Adidas has high hopes that its new design will soon become a favorite among avid runners.